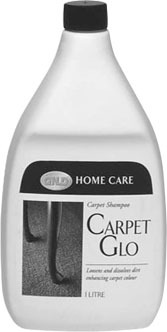 A good carpet shampoo must be able to produce a great amount of “dry” foam which can penetrate and dissolve the dirt. It must not be absorbed and be allowed to penetrate into the bottom of the carpet since this could result in damage to the carpet. Obviously it must not be allowed to adversely affect the fibres or colour of the carpet either. Carpet Glo fulfils all these requirements and gives the excellent care needed to maximize carpet appearance and functional life. Very economical - cleans at dilutions of 1 part Carpet Glo to 40 parts water. Effective for hand cleaning of colour safe carpets and fabrics. Safe for use with carpet cleaning machines. Versatile - makes an excellent window, mirror and chrome cleaner. Before cleaning a carpet, it must first be thoroughly vacuum-cleaned to remove all loose dirt. Mix Carpet Glo according to the directions and apply. The application can be done either manually or using a machine. The mixture can vary depending upon in which manner the application is made. In very dirty areas, it may be necessary to make an extra application; in this case, care must be observed to avoid soaking the carpet. After the cleaning, let the carpet dry completely. Important for machine cleaning: If you choose to use a carpet cleaning machine, follow machine manufacturer’s use instructions closely, including shampoo dilution instructions. Then vacuum-clean the dry carpet again. The second vacuum-cleaning removes all dirt which has been loosened by Carpet Glo. Observe how the carpet looks after being cleaned. This appearance is caused not only by the dirt-removing effect, but also by the effect of a special substance in Carpet Glo which enhances the colours. Very Important: Carpet Glo can be used for most popular carpet materials. However, certain carpet manufacturers use colours which cannot tolerate the cleaning procedure. Therefore you should always test Carpet Glo in a small inconspicuous corner of the carpet and you should carefully ensure that there is no discolouration or removal of the colour. We recommend that this test should be done the day before so that the carpet has a chance to dry completely. One part of Carpet Glo mixed with 40 parts of water. Cleaning Upholstery on Furniture, etc. First check any special recommendations by the manufacturer/seller. 1 part of Carpet Glo mixed with 30 parts of water. Carpet Glo must not be used in carpet shampoo machines where the shampoo is not allowed to create foam. Windows, mirrors and chrome cleaning. A few drops of concentrated Carpet Glo in a spray bottle with water is excellent for washing windows, mirrors and chrome. Leaves them shiny, spotless and streak-free. Note: Do not make the solution too strong as streaks may appear. Circulate a bottle among the guests. Point out the economical aspects of using this mixture for carpets and upholstery. You can show the Carpet Glo concentration in the following manner: Pour some Carpet Glo into a spray bottle and fill with water. Shake thoroughly and pour out the foam a couple of times to show how concentrated Carpet Glo is.